Writer, actor, artist, teacher, exploring the world and its levels in fiction, poetry, memoir, photography, fine arts. Several years ago my sister Debbie gave me a copy of Patrick Leigh Fermor’s “Between the Woods and the Water,” the second half of his two-part memoir of walking across most of Europe, from Holland to Constantinople, between Christmas 1933 and January 1937. Why Deb gave me the second of the two books to start with I don’t recall; it may be that she considered the second one a better book, or one that I would especially enjoy because much of it takes place in terrain I had explored to some extent during travels in central Europe in 1989-1990. I only know that I was quickly drawn into Fermor's journey, and traveled gladly with him across central Europe. I only got around to starting volume one, “A Time of Gifts,” during my current visit to Australia where I attended a commemoration of the life of my sister Debbie, following her death in December from multiple myeloma. As I threw together my suitcase the morning of my departure, I considered and discarded several reading possibilities: too bulky, too dry, too familiar; I wanted something that would be just the right mix of narration and information. I hastily scanned my bedroom bookshelf's eclectic collection, and my eye settled with joy on the shelf devoted to Fermor. My untouched paperback edition of “A Time of Gifts” suddenly seemed the perfect choice. And so it has been proven to be. 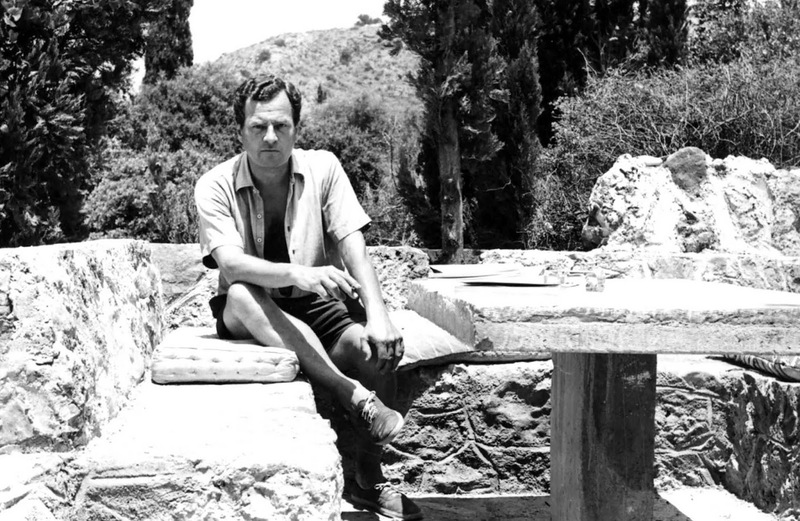 In the book’s introduction, a long letter to his friend Xan Fielding whom he met during World War 2 as they served as fellow soldiers in Greece, Fermor describes his upbringing and early education, all of it marked by periods of instability, disaster and recovery. 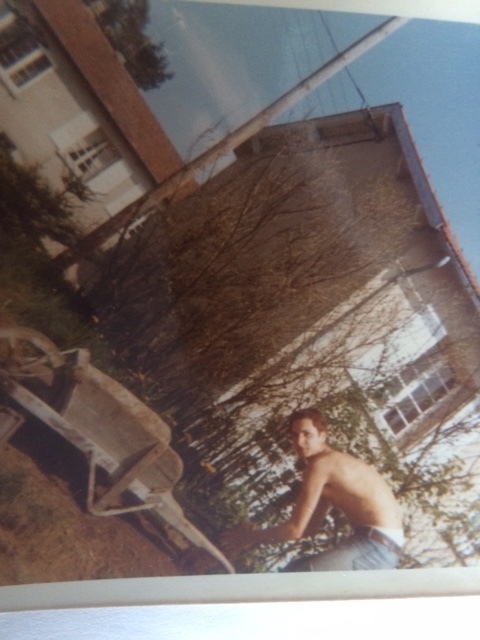 He’s 19 when the idea occurs to him to walk across Europe, and his descriptions of himself and his thought process, his attitude toward the world around him, capture something about a young man of that age that remind me of myself, living semi-independently in France at 17 and 18, working in a French village, hitchhiking from Paris to Holland at Christmas, 1971, to visit a Dutch friend from the summer camp in southern France that started my two-year adolescent adventure in European living. "It was still a couple of hours till dawn when we dropped anchor in the Hook of Holland. Snow covered everything and the flakes blew in a slant across the cones of the lamps and confused the glowing discs that spaced out the untrodden quay. I hadn’t known that Rotterdam was a few miles inland. I was still the only passenger in the train and this solitary entry, under cover of night and hushed by snow, completed the illusion that I was slipping into Rotterdam, and into Europe, through a secret door. I wandered about the silent lanes in exultation. The beetling storeys were nearly joining overhead; then the eaves drew away from each other and frozen canals threaded their way through a succession of hump-backed bridges. Snow was piling up on the shoulders of a statue of Erasmus. Trees and masts were dispersed in clumps and the polygonal tiers of an enormous and elaborate gothic belfry soared above the steep roofs. As I was gazing, it slowly tolled five. The lanes opened on the Boomjes, a long quay lined with trees and capstans, and this in its turn gave on a wide arm of the Maas and an infinity of dim ships. Gulls mewed and wheeled overhead and dipped into the lamplight, scattering their small footprints on the muffied cobblestones, and settled in the rigging of the anchored boats in little explosions of snow. The cafes and seamen’s taverns which lay back from the quay were all closed except one which showed a promising line of light. A shutter went up and a stout man in clogs opened a glass door, deposited a tabby on the snow and, turning back, began lighting a stove inside. The cat went in again at once; I followed it and the ensuing fried eggs and coffee, ordered by signs, were the best I had ever eaten. I made a second long entry in my journal – it was becoming a passion – and while the landlord polished his glasses and cups and arranged them in glittering ranks, dawn broke, with the snow still coming down against the lightening sky. I put on my greatcoat, slung the rucksack, grasped my stick and headed for the door. The landlord asked where I was going: I said: ‘Constantinople.’ His brows went up and he signaled to me to wait: then he set out two small glasses and filled them with transparent liquid from a long stone bottle. We clinked them; he emptied his at one gulp and I did the same. With his wishes for godspeed in my ears and an internal bonfire of Bols and a hand smarting from his valedictory shake, I set off. It was the formal start of my journey." This strikes me as quintessential journal work. My own journal writing tends toward the descriptive at times, not here on this relatively infrequent public platform, but in my book journals which fill another shelf in addition to the current volume always with me and to which I return, in the best of times, several times a week or month. I often start an entry stating where I am, what I’ve just been doing, who I’ve been with, and what has been or is at that moment on my mind. Unlike Fermor, though, I generally make a jump from these concrete accounts to something more internal and reflective: observations on my mood and its current source; concerns about my future or my state of mind; complaints about this or that unfulfilled dream or wish; and often, what I take to be thoughtful, perhaps insightful musings on the nature of time and space, consciousness, mystery, magic, dreams. And at times, as now, I write about journaling itself, which Fermor seems rarely to do. “Imaginary interiors… no wonder they took shape in painting terms! Ever since those first hours in Rotterdam a three-dimensional Holland had been springing up all around me and expanding into the distance in conformity with another Holland which was already in existence and in every detail complete. For, if there is a foreign landscape available to English eyes by proxy, it is this one; by the time they see the original, a hundred mornings and afternoons in museums and picture galleries and country houses have done their work. These confrontations and recognition-scenes filled the journey with excitement and delight. The nature of the landscape itself, the colour, the light, the sky, the openness, the expanse and the details of the towns and the villages are leagued together in the weaving of a miraculously consoling and healing spell. Melancholy is exorcised, chaos chased away and wellbeing, alacrity of spirit and a thoughtful calm take their place. In my case, the relationship between the familiar landscape and reality led to a further train of thought. We come to know the young Fermor by the care he takes to paint for us what he remembers and what strikes him as worthy of note. The details are the characters, the protagonists; he, the journeying youth and the writer, is the artist standing outside, facing the easel of the page, immersed in resurrecting and reliving long ago events and places, at least the bones of which he preserved in his journal at the time -- forty years before the publication of the book -- but much more, one presumes, held in memory or painted in from later visits and research. Indeed, yes. We see what it’s like. Extremist, intolerant, resentful young men, drunk with the headiness of myths that would “make ____________________ great again,” wear similar garb, whether brown or black-shirted, white robed or black-hooded, red-arm-banded or red-hatted. They say the same things, choose the same targets, and are generally just as amenable and harmless as “Franzi” until their numbers grow and the fever swells, the demons are released en masse, and the world falls into another fever of murderous fury and aggression. 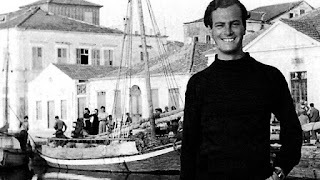 Writing from his journals and memory well after the end of World War 2 ("A Time of Gifts" was first published in 1977), Fermor chillingly but unemotionally conveys the sense of a country still at a stage of its history when it might have turned back from the abyss -- but didn't. “After writing these words and wondering whether I had spelt the name Spengel right – also to discover what had happened to the family – on a sudden impulse I sent a letter to the Red Ox, addressed ‘to the proprietor.’ A very nice letter from Fritz’s son – he was born in 1939 – tells me that not only my host and hostess are dead, but that Fritz was killed in Norway (where the first battalion of my own regiment at the time was heavily engaged) and buried at Trondheim in 1940, six years after we met. The present Herr Spengel is the sixth generation of the same family to own and run this delightful inn." Even here, Fermor refrains from sentimentality or reflection. The fact that he was curious enough to write that letter, await its response, and include the gleaned news as a footnote says more about him than any description of his feelings perhaps could. Or maybe they show a man of his time and nationality -- “stiff upper lip and all that” – who leaves it to the reader to form his own conclusions and indulge, or not, in his own feelings. In any case, one can't ignore or be untouched by the fact that his wayside friend Fritz was killed battling Fermor's own regiment six years later, at the very onset of the horrific war foreshadowed by that sharply observed confrontation with the drunken Franz at the Red Ox. 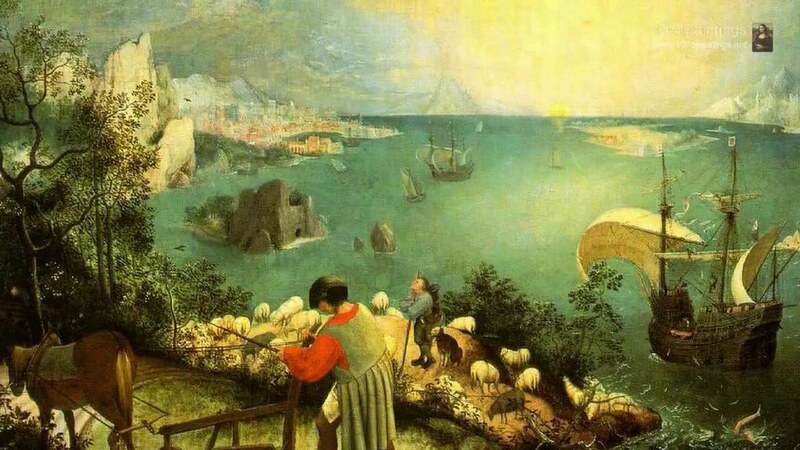 As in the Dutch Renaissance Bruegel's "Landscape with the Fall of Icarus," in "A Time of Gifts" Fermor's inner experience is almost incidental. The landscape is the vessel in which other stories unfold, through which his protagonist moves like a camera. In the painting, the tiny splash of Icarus hitting the water in one corner of the bustling, busy world is almost lost, and intentionally minimized. And yet, it’s needed. Without Icarus’ wild flight and over-reaching desire to reach the highest zenith of the sky, there is no narrative. Humans need a story with a flight to it, a rise into some sky or another of imagination and wonder, some danger and escape, or climactic fall to destruction and possible redemption. 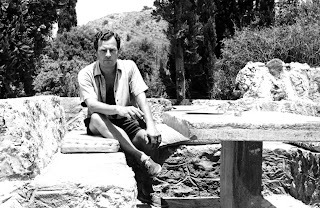 Fermor – Old Master that he is – paints the great picture within the frame, and places himself and by extension us peering over his shoulder, in a corner: a point of consciousness, a curious, observing eye all but lost, yet essential in the midst of the wonder - and tragedy - of creation. MAP is back! 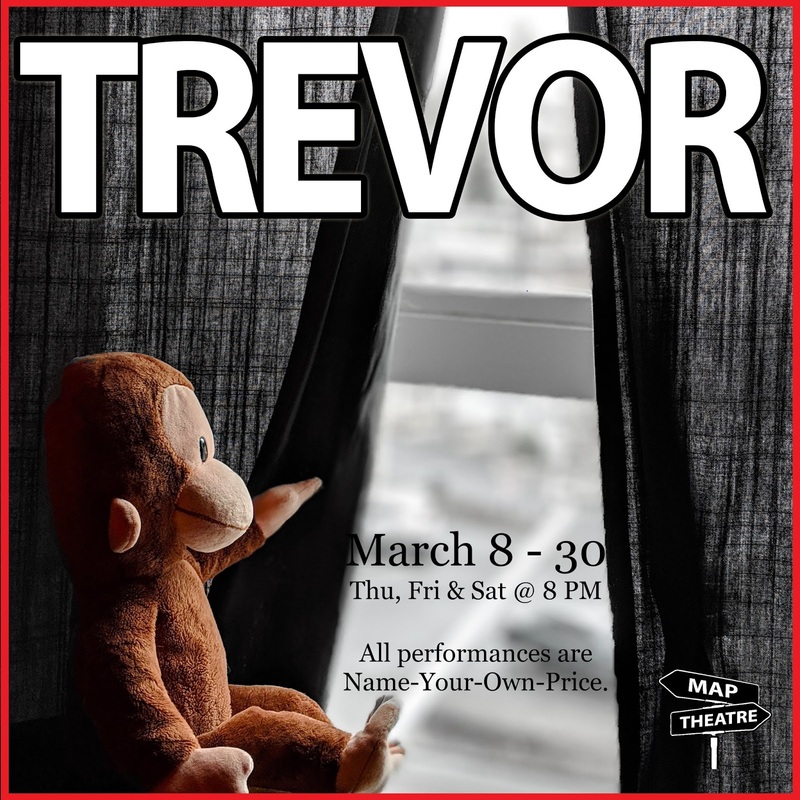 Nick Jones’ “Trevor,” directed by Julie Beckman, spins real events involving a celebrity chimpanzee named Travis into a fierce and phantasmagorical fable about human miscommunication, self-delusion and isolation. Michael D. Blum brings depth and compassion to his role as the stolid local cop uncomfortably trapped by his duty. 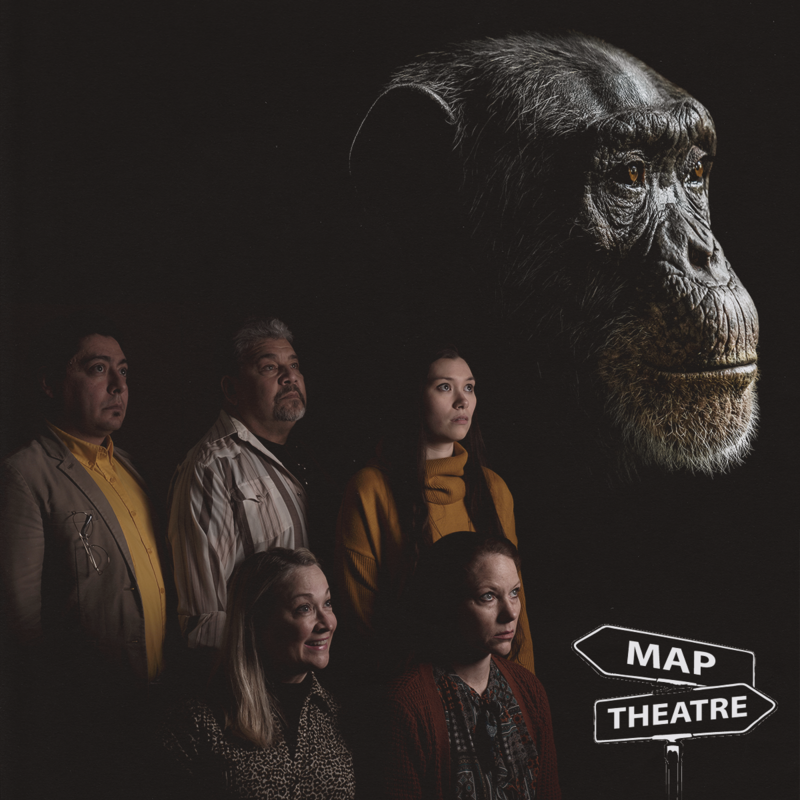 The remaining cast (Danielle Daggerty and Jesse Calixto) do fine work as the animal protection officer and Trevor’s imagined friend Oliver, a former chimp star like himself whose career has taken a dive. The strong cast delivers energy enough to carry the somewhat over-burdened script swiftly to its climax. 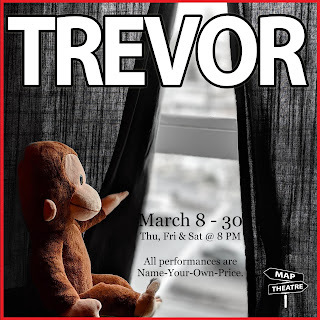 “Trevor” is madcap and touching, and in true MAP fashion, mixes weirdness and hijinks with revelatory glimpses into that weirdest of all creatures: homo sapiens. Despite occasional repetitiveness, the script rewards with food for thought about the delusional worlds we inhabit, interpreting events and other people through our personal languages and filters, never fully knowing what we truly are or why our lives unfold as they do. MAP reliably delivers entertaining, thoughtful work, and its commitment to making theater accessible to everyone through its "choose your own price" ticketing model is an admirable commitment more companies in town should emulate. The venue is small, so I suggest buying tickets in advance, through Brown Paper Tickets (select your own price range, and MAP waives service fees!) MAP isn't on stage that often, so catch this while you can.